I remember getting a new 10-speed bike for my 12th birthday. I was walking home from school when I saw a nice, shiny, red bike sitting in our front yard. I thought someone was visiting and had ridden to our house on his/her bike, so I walked into the house and asked, "Who's here?" My mom just smiled and said, "No one." I was confused and asked who the bike belongs to. 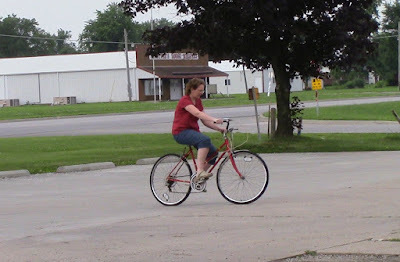 My memory has faded a bit and I don't remember much after that, but I think my parents took me outside and said maybe I should get on the bike and see if its a right fit for me since there was no one else around to claim it as theirs. I eventually figured out that it was my birthday present. I don't know if I outwardly showed it, but I was surprised, excited, and pleased. 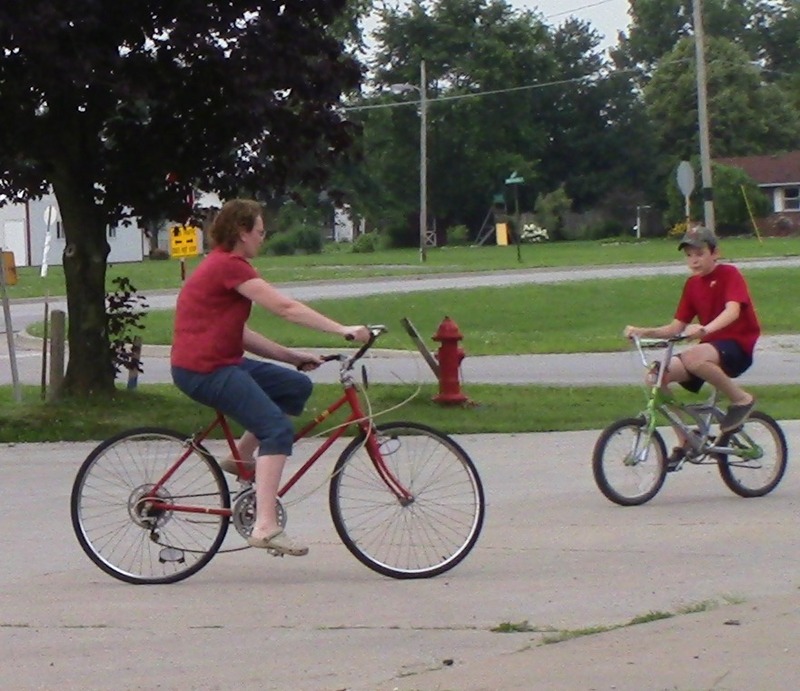 We often went on family bike rides around town and had so much fun. And, that 10-speed bike made it so much easier to pedal uphill! 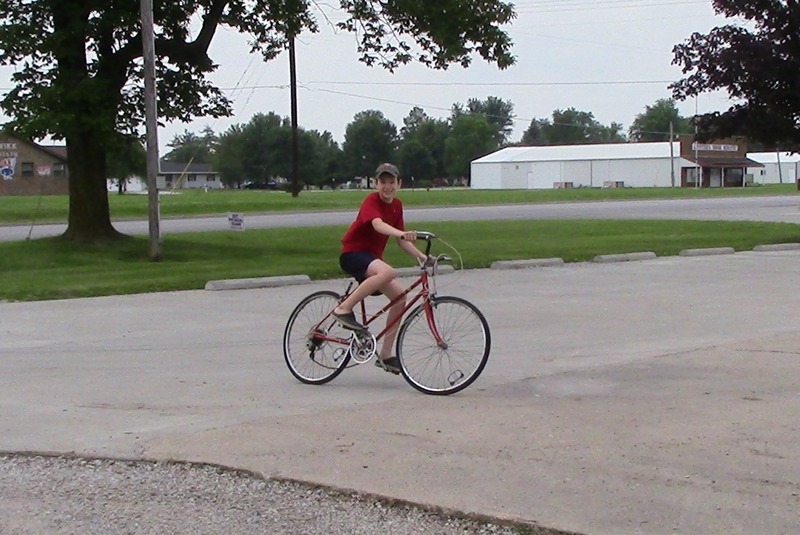 I still have that bike, and surprisingly, it is still in pretty good shape after all these years. So, over the weekend, I had David get the bike down from the ceiling in the garage and see if the tires would hold air. Our 12 year old son is beginning to outgrow his little bike, so I thought maybe we could see if he could ride mine. Yay! The tires DID hold air! Then, can you guess what happened next? I just HAD to try it out myself before letting our son give it a try. I've heard it said, once you learn how to ride a bike you never forget how. I honestly can't remember the last time I rode this bike, but I'm pretty sure it was before David and I had kids. That makes it at LEAST 17 years ago, maybe more. But, guess what? I DID remember how to ride it! Wow, I forgot how much fun it can be to ride a bike... and how good it is for getting some exercise. After my legs began to beg for mercy, I let our 12-year-old son ride it, too. He says "it will do" until he can get a bigger bike of his own. The opportunities for simple enjoyment in our lives are limitless. What a fun time we had riding bikes together, remembering old times, and making new memories as well.